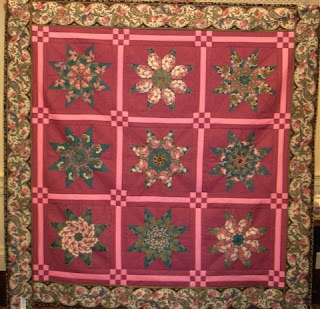 The book with this pattern and many others is called "Magic Stack and Whack Quilts" by Bethany S. Reynolds (ISBN 1-57432-704-6) and I highly recommend it if you are interested in these sorts of designs. 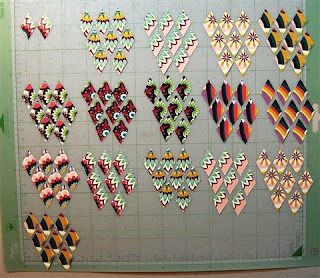 In a nutshell, her technique involves aligning identical repeats of fabric and then cutting through the entire stack to create diamond or other shapes which can be combined to form new patterns. The best sort of fabric for this technique is a bold busy print with lots of colors. 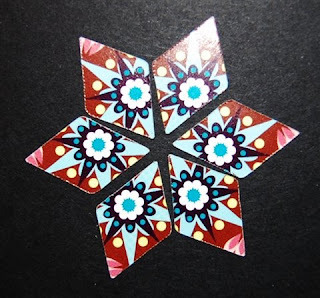 The designs are always a surprise when you separate the stacks and assemble the stars. 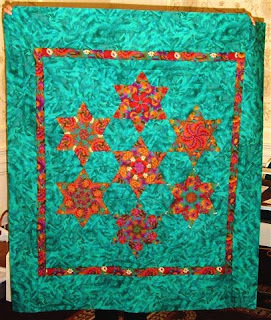 Here is another quilt top using 45 degree diamonds for eight pointed stars. 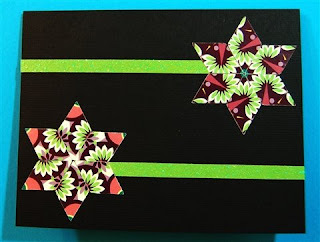 So, I thought, why not try this with paper - I can't stack layers of paper on the Cricut but I could use the Design Studio software to cut in exactly the same place on identical sheets of paper over and over. Here is the paper I started with (many thanks to my friend Nancy who picked this up for me while she was shopping via cell phone instructions about the type of paper I needed). My scrapbook style is very simple and I can't imagine ever choosing this for my background 12 x 12 paper but it was perfect for this experiment! I started out using the diamond on the George cartridge at a 1 inch size - it looked to be the right type of diamond so I cut an entire row of these, taking care to put the paper on the mat in the exact same position each time. Unfortunately, after all this cutting, I discovered that the diamond on the George cartridge is not quite right! This time I was more cautious and test cut first on plain paper - it worked! The only slight problem is that the diamond does not have sharp points - they are slightly rounded so the joins are not entirely perfect but close enough! 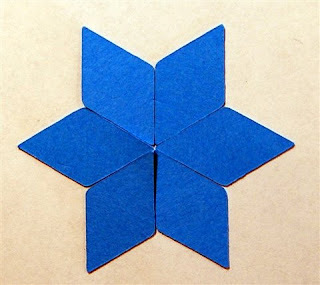 While this design requires only six diamonds - I cut eight sheets of paper to give me a few extras to compensate for any errors in loading the mats. This was a good decision, as you can see below, there is at least one diamond in each set that is slightly "off. Once you get all your sets of diamonds cut you can have fun seeing what designs result when you combine them - depending which tip of the diamond points to the center you will get a totally different "look"
Here are some more photos showing the fascinating combinations that can result - in each set of three below the top row shows a set of six diamonds with one end of the diamond pointing to the center and the bottom row shows the opposite way around - see how different they can look! 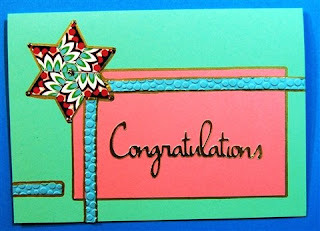 Here is a close up of the star - done up with gold outlines and "Stickles" glitter glue! So - if you have the patience, give this a try. 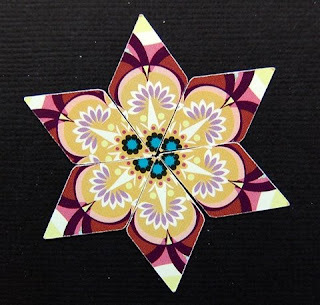 I plan to do a few larger sizes and to try the eight pointed star too. 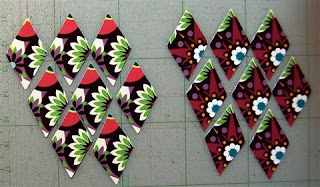 These are great for cards or decorative accents on scrapbook pages - use your imagination and see what you can do. 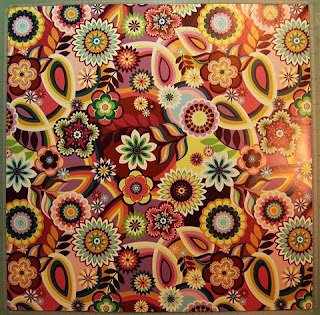 Remember, the wilder and more colorful the paper, the more exciting the results will be. Have fun with this! 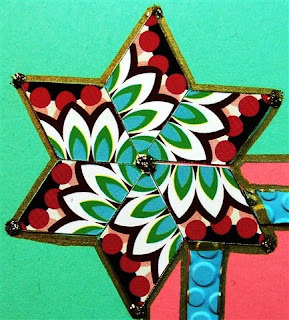 Your stars remind me of the southwestern/Mexican tiles that I love! 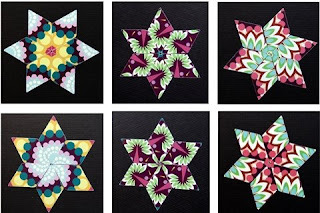 Thanks for sharing a neat adaptation of your quilting love! Wow! Amazing! I love your creative mind. You come up with such cool stuff. Hugs! You never cease to amaze me with your meticulous designs! Thanks for sharing it all with us more time-challenged creators!! These are fabulous. Thanks for sharing these. Can't wait to try one someday. Love the designs. I know you worked really hard on trying to get it just right. Congratulations, it worked. 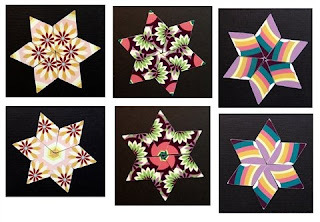 It is possible to take a star pattern from a quilting book, copy it, and cut that up and make different designs? Thanks for the info. I will try it. Ooooh, lovely stars! 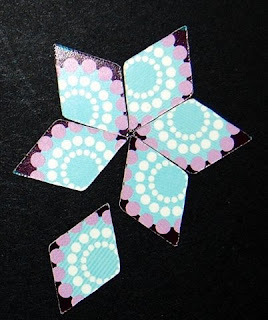 This would be fun to try with the Imagine, especially once Cricut Craftroom allows us to cut/print, so you can position the patterns exactly as you want.